Selleck, at six feet four, 210 pounds and 44 years of age, is proud of his athletic ability. He is an Olympic-caliber volleyball player and claims his greatest achievement was recently being named to an all-American team for men 35 to 45. He also likes to talk about his college basketball days, and how he could really leap. "l didn't have white man's disease," he says. "In one episode of Magnum, we ended the show with me dunking a basketball. It was really important for me to do that without camera tricks." 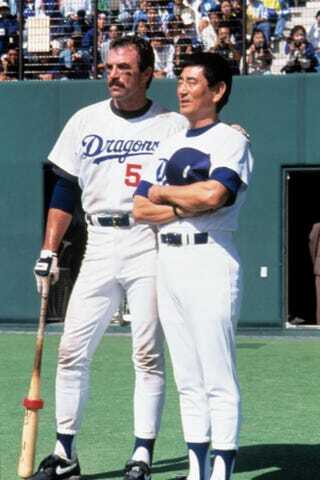 It's important, too, for Selleck to take batting practice at least once a year with a major league team. He has done so with the Orioles ("l hit a few out at Memorial Stadium") and with the Tigers ("A few players were screwing around in the outfield. When I hit one between them, they just looked.") and, this past season, with the Dodgers. This time, it did not go well. Selleck stood behind the batting cage with the pitchers, waiting to take his swings against the easy lobs of one of the team's older coaches. The pitchers kidded around, occasionally including Selleck in their jokes. He laughed nervously. This was obviously an important moment for him. He had spent the previous day at a batting range in preparation and did not want to look foolish. Steve Garvey, the former Dodgers first baseman, walked onto the field accompanied by his latest wife, a striking cotton-candy blonde. Garvey, dressed in a navy blazer and tan trousers, looked less like a ballplayer than an actor. One of the Dodgers said to another, "Who's that with Garv?" "She's the one who's not pregnant." Selleck went over to talk to Garvey. They chatted under a bright sun, two men who have embellished their careers by being "nice." Finally, it was Selleck's turn to hit. For the next hour he struggled, sweating and lunging, foul-tipping or just missing pitch after pitch. There was a lightness to his swing. He didn't attack the ball, driving toward it with his shoulders, but swung only with his arms. "You swing pretty good," said one pitcher, "…for an actor." When batting practice was over, Selleck heard a stern voice calling him from the seats behind home plate, "Thomas! Thomas!" He went over to Chandlee, who was seated alongside Selleck's elder brother, Bob. "That was humiliating!" Selleck said. "Oh, Thomas!" [Selleck's publicist Esme] Chandlee said. "That pitcher was throwing hard." "He was," Selleck said. "Wasn't he?" "Pretty hard," said Bob, who had been a pitcher in the Dodgers organization years ago. Bob is a boyishly tousled, Alan Alda sort of guy, who stands almost six feet six. Selleck is close to his brother, and to all of his family, whom he refers to as his best friends. He also has a younger brother and a sister; they, along with their father, Bob Sr., and mother, Martha, make a strikingly beautiful family. "Heads just turn when they all enter a room," says Chandlee.